Fiberglass doesn't absorb stain at all, the stain dries on the surface. Penetrating stains are more likely to run or mini sags on the flat portion of the doors and the corners. Penetrating stain would need to be spread far. Did my first one using this method. Fun learning Experience. Enjoyed how it actually looks more like wood or almost identical. Things I had a little trouble with were getting excess stain out of the profiles so it wouldn't drip on the edges around the profiled parts. Only really had 1 drip after 3 hours of it sitting. Since it dries so slow I was able to fix it. Used Old Masters wiping. Currently drying. Jack How long did you let it sit? Which Zar did you use? Thinking 24 hours + for this before clear coating. Also don't judge me to hard the color is perfect there are a few spots of starting and stopping that are visible to us but as I tried to fix those I ended up over working some spots. Matching Clear coat cherry was interesting. The dry time depends on temperature. Sometimes there is no problem applying clear next day. I stained an outside door today. I think the high was 46℉ so I won't try to apply clear until Thursday. You'll learn where to place the loads of stain, (hint) not in the grooves. Here is a better pic of the overall look. They are super pleased. Not only with the work but that it could be done. Few places told them it couldn't. Few others wouldn't do it. I ran into similar issue when talking about it. 1 paint place said they wouldn't touch it. 1 said use a gel stain. Few people looked at me cross eyed. Thanks Jack. Probably would have gel stained this or not takin the job had I not been apart of the forums. Checked on door. Had 1 spot to fix and ill clear it this saturday (7 mins from my house). 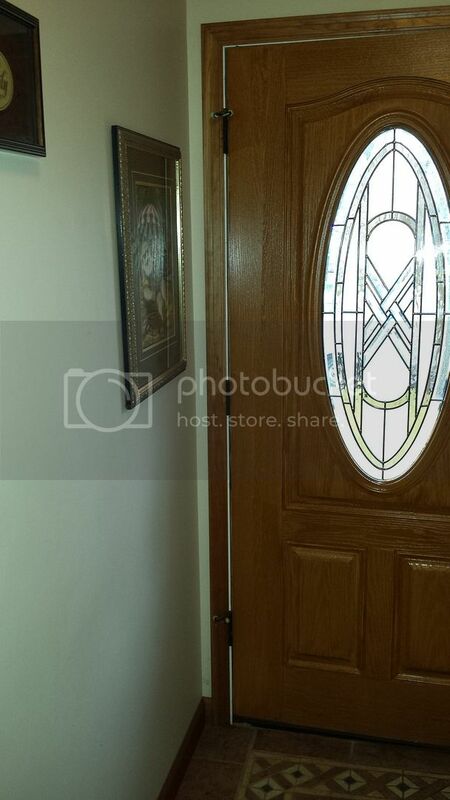 Here is a photo of my first successful stained fiberglass door. I never had much luck with gelstain unless the the color was really dark. Tried out Old Masters wiping stain and was impressed with the result. 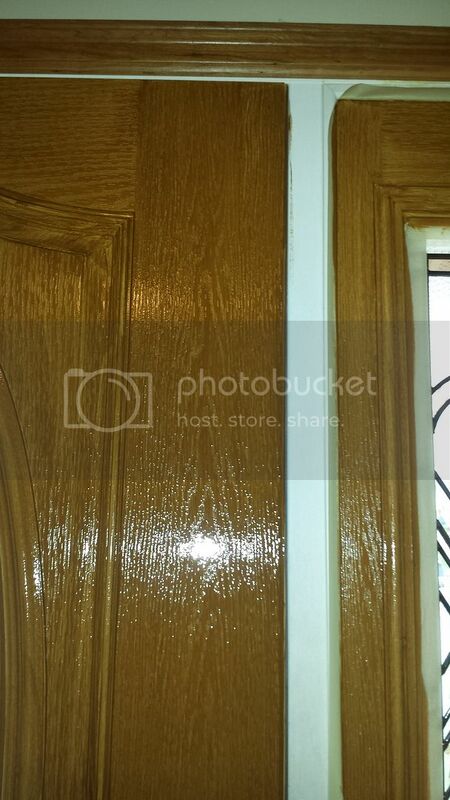 This door dried for over 30 hours and the stain was still sticky and not in any condition for clearing. I had to put a strong fan on it over night. That dried it completely. Jack, new user and appreciate the knowledge you are supplying on the fiberglass staining! 1. that door in the first post, what color stain is that from zar? How many coats of stain? Is that modern walnut? Trying to find a medium brownish color, not too dark as i get full sun but not much if any red. 2. If i understand correctly, you did NOT use a graining base on the new door? You just used the existing beige color it ships new as, correct? 3. When you apply the stain, you are not wiping it off afterwards? Just putting a coat on and letting it dry as is. Then second coat if neccessary, then poly. 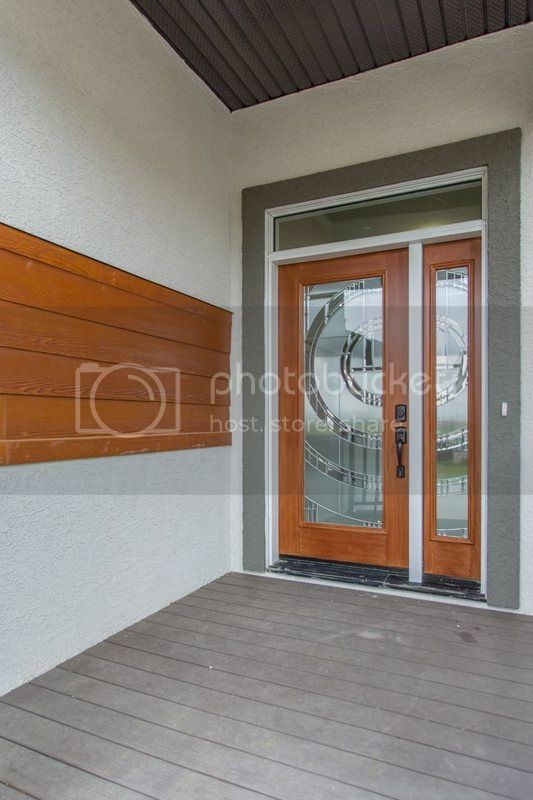 I came across one of your other posts on another site that showed this pic, did you stain the door or was that already completed and you were just trying to match the garage? 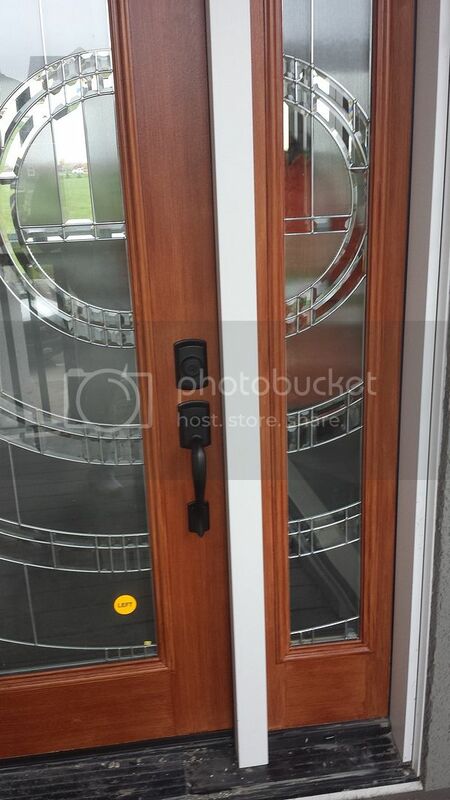 Im looking to get my new door to this color below. Do you know what stain color that is or suggestions on roughly matching? Yes, I stained the door and jamb to match. I do not recall which color it was, maybe American Walnut, Special Walnut. Not sure which stain was used. Would have been Zar or Old Masters. 1. I do not recall which color stain. American Walnut or Special Walnut or maybe a blend of both. 2. I did not use a graining base on the new door. I stained over the factory fiberglass color. 3. No wiping. Brush it on, let dry. 4 coats of clear for heavy sun.